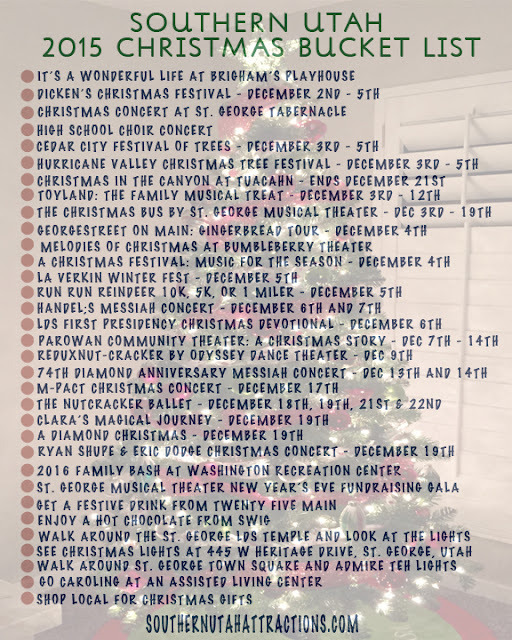 Southern Utah Attractions: Southern Utah 2015 Christmas Bucket List - Free Printable! Southern Utah 2015 Christmas Bucket List - Free Printable! Happy December! December is probably one of my all time favorite months in the year. I hate the cold but I love Christmas and New Year's Eve! There are so many fun events happening in Southern Utah this December. I need a big, never ending bucket of money so that I can go to all of these events. And a few extra hours in the day wouldn't hurt either ;-) You can download a free Southern Utah 2015 Christmas Bucket List by clicking here. Let me know if you have any problems and I'll be happy to help! Get out there and do some fun stuff this holiday season! Do you want a generic Christmas bucket list? You can download that by clicking here.